In the scheme of things, the power purchase agreement disclosed last month by dairy cooperative Organic Valley isn’t very big — slightly less than 13 megawatts of solar in phase one of the project. That’s exactly why it’s a noteworthy sign of progress for the corporate clean power procurement movement. Under the deal announced in late October, the organization has entered into what it describes as a “first-of-its-kind” community solar partnership in collaboration with the Upper Midwest Municipal Energy Group (UMMEG), a joint action agency representing 15 electricity providers from Wisconsin, Iowa and Minnesota. The 25-year-long arrangement will allow UMMEG to start sourcing clean renewable power from multiple solar projects as soon as next year, displacing about 12 percent of its existing generating sources, predominantly coal-fired power plants. Organic Valley, which represents 2,000 farmers in 36 cities, won’t be able to use all the power directly — although it will be able to source electricity from a 2-MW installation planned near its site in Cashton, Wisconsin. There’s also potential for 17 more MWs of construction after the initial phase. The co-op will buy all the renewable energy credits associated with the sites, all of which will adopt pollinator-friendly designs. The meadows underneath them will include native plants and grasses — the equivalent of 30,000 families creating a six-foot-by-12-foot garden. The RECs will enable Organic Valley to cover all electricity generated by its headquarters, processing and distribution sites with renewable power by the end of 2019, estimated Jonathan Reinbold, head of sustainability for the coop. “Our hope is that this partnership to install community-scale solar will be replicated by municipal utilities around the country and propel more rural communities toward economic stability and energy independence,” Reinbold said. This is not Organic Valley’s first foray into renewable energy. 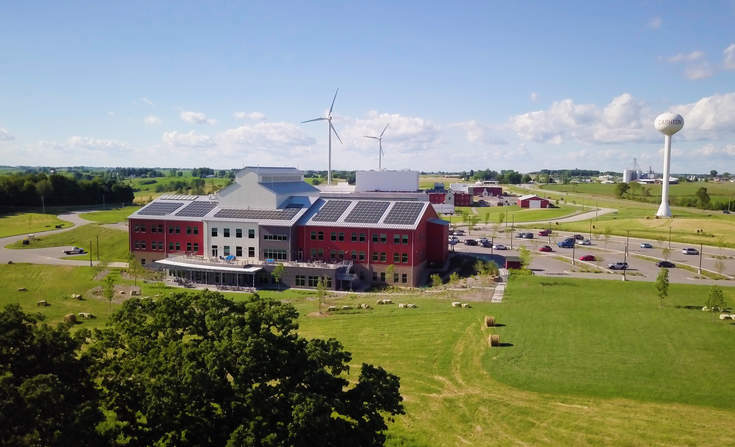 The company previously teamed up with UMMEG — and Gundersen Health Systems in La Crosse, Wisconsin — to help create a two-turbine, community-supported wind farm on the Cashton Greens next to Organic Valley’s campus there. Each company invested $5 million in the 5-MW facility, taking advantage of tax incentives and creating a limited liability corporation to own and operate the project. Organic Valley, which generated about $1.1 billion in revenue in 2016, also has invested in several small solar installations (about 200 kilowatts in capacity) on roofs of some of its corporate buildings, and it has experimented with some geothermal and solar thermal systems. It has experimented with on-farm biodiesel initiatives. The expectation was that those investments — a total of $6 million over the past six years — would help the co-op make a “100 percent renewable” claim but the organization’s growth over the past several years made that more difficult, Reinbold said. In 2014, Organic Valley managed to cover about 81 percent of its power needs with renewable wind and solar energy; by the end of 2016, the amount was closer to 50 percent, he estimated. When it began considering next steps that would help it work toward a carbon neutral future, the co-op didn’t set out in search of a community solar project. It actually was exploring a virtual PPA, but dropped that idea because the pricing and terms would have required review by the public service commission, traditionally hostile to renewables investments.The community solar arrangement with UMMEG didn’t require a special review, and it built on an existing relationship — the municipal group buys all of the wind-generated power from the Cashton Greens project. What’s more, “this had the opportunity to be more impactful” within the region because it enables residential customers and other businesses to source clean power, Reinbold said. Aside from Wisconsin, some projects may be in Minnesota, although the final decisions haven’t been made. The deal was brokered by OneEnergy Renewables, which focuses on helping develop commercial and institutional projects that range from 2 to 50 MWs in capacity. 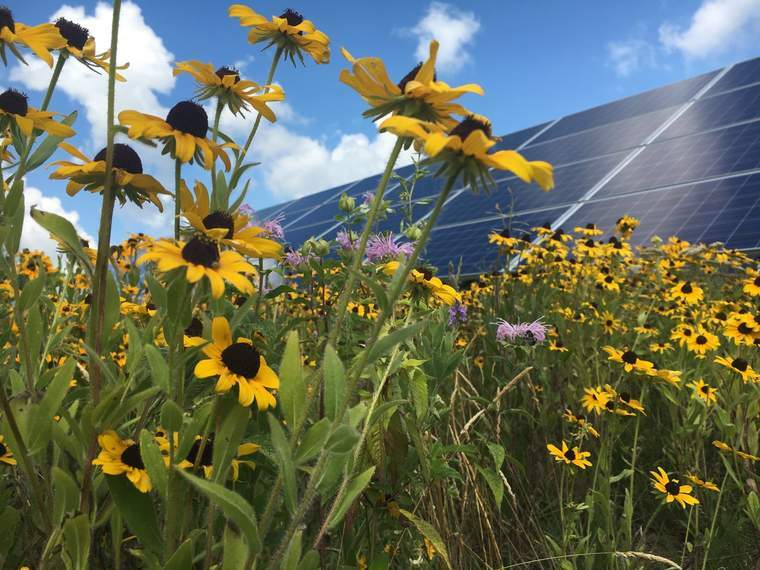 For example, OneEnergy was behind a certified pollinator-friendly project in Maryland that supplies the Verizon Center and the National Geographic Society headquarters in Washington, D.C. It was involved with projects at General Electric and Ithaca College. OneEnergy’s participation was instrumental in winning over the Organic Valley executive team responsible for sustainability initiatives, Reinbold said, estimating that the negotiations took about 13 months from start to finish. “That was one of the biggest barriers: demonstrating that this was real,” he said. Bill Eddie, CEO and co-founder of OneEnergy, said the cooperation between Organic Valley and UMMEG was necessary for the deal to happen — and it’s a dynamic he expects to play out again in the future as more midsize companies seek creative ways to invest in clean power. Community solar programs are seen as one emerging way for organizations with more modest electricity needs than many of the mammoth companies investing in PPAs to help add renewable, clean power to their operations — either virtually or directly. Initiatives aimed as scaling this mechanism are becoming more common. Earlier this week, for example, renewables developer ENGIE announced a partnership with Clean Energy Collective (CEC) meant to hasten the spread of this option in the Northeast United States. The two are behind a community solar plan in Massachusetts that includes a portfolio of 17 installations; indeed, they are pursuing dozens of projects across five states. ENGIE is the fourth largest, non-residential electricity provider in the United States with a presence in 14 markets. “Our relationship with ENGIE, coupled with our unmatched ability to deliver localized, market-specific community solar solutions on a national scale, makes the possibilities for community solar nearly limitless,” said CEC founder and CEO Paul Spencer. You should also keep an eye out for new services from LevelTen Energy, an almost-two-year-old venture fronted by CEO Bryce Smith, co-founder of OneEnergy. The startup is working on procurement options that will allow multiple corporate buyers to buy into a portfolio of new projects — a purchasing mechanism he likens to a mutual fund and that helps spread the risk. “If you look at the PPA process to date, there are issues. For starters, 99 percent of corporate buyers are shut out. … It’s extremely hard to buy into a large or economical project,” Smith said. This story was updated Nov. 2 to clarify that Organic Valley is not a Certified B Corp.